I was recently looking a property in the LA area of California. When a house I was looking at was listed for sale, about 20 written offers were received. I was amazed. Recent stories in the LA Times state that there is a property boom (or property undersupply) in parts of LA. See: Low Inventory and 28% Increase. 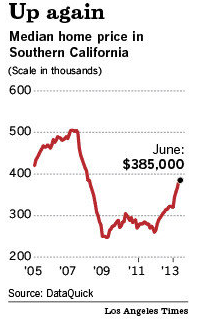 There was also a jump in the median sales price in San Francisco.